Graphic Novel has Life of Its own! After much conversation, prayer and reflection, I've made the call to expand the Eye Witness graphic novel series into an additional volume, taking the series from a trilogy to a tetralogy (utilizing the ancient Greek term for theatrical works constructed in four parts). 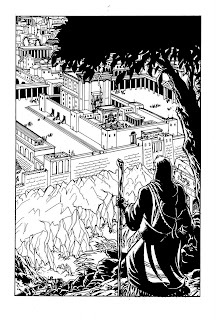 Back in 2002, I had started out to create only a stand alone graphic novel about the Passion week with the original Eye Witness volume, (A Fictional Tale of Absolute Truth), but shortly after it's publication in August of 2004, I began hearing from enough of fans of the book that expressed interest in seeing the "rest of the story", that I decided to extend the series to a trilogy, through incorporating an adaptation of the Book of Acts into the narrative and thus creating a sort of graphic novel presentation of the birth of the Christian faith (see: http://www.headpress.info/ ). Upon writing the working script and laying out the pages for the third volume though, (Rise of the Apostles), I have found that this final book in the series was taking on a life of it's own and was going to run in excess of 170 pages (twice the size of either of the first two). Given the fact that the plan was to release book three in the summer of 2008, it had become apparent that that deadline was looking more and more tenuous, (since I not only do the writing, but also the illustrations for each volume). Every time I sat down and started to layout pages, I was adding more and more content in an attempt to get the book just the way I wanted it, (the good news and bad news of being a self-publisher). With the number of pages and amount of detail I was putting into them, realistically I would not have had the book ready for publication possibly till early-2009...and that was way too long to leave the fans of the series waiting. So the decision was made to roll the one large and ever-expanding story into two volumes, released within a year of each other. Eye Witness (book three): Rise of the Apostle, is scheduled for release in August of 2008, with a world-premier at Comic-Con International in San Diego, the last week of July ( http://www.comic-con.org/cci/cci_reg.shtml ). The cover painting for this volume is provided by Lee Moyer, (http://www.leemoyer.com/) and additional internal coloring by Carsten Bradley, (http://www.comicspace.com/vagabondarts/). The fourth and final (as of yet, un-named) volume of the Eye Witness tetralogy, will tentatively release from late 2009 to early 2010.